Returning to Leeds after the recent Road to Paris series, Red Bull Music Academy joins forces with Mint Club in Leeds on Friday 27 February for a night of great music and atmosphere. Reeling off a six hour set, three DJs go b2b: London’s purveyor of future bass and early herald of the UK garage/house revival Joy Orbison steps up against Detroit techno shaman and Ghostly International’s Ryan Elliot, while New York’s Evan Baggs proves his mettle as a word-of-mouth artist who’s risen through the ranks to possibly be in demand across the globe, from Brazil to China and beyond. 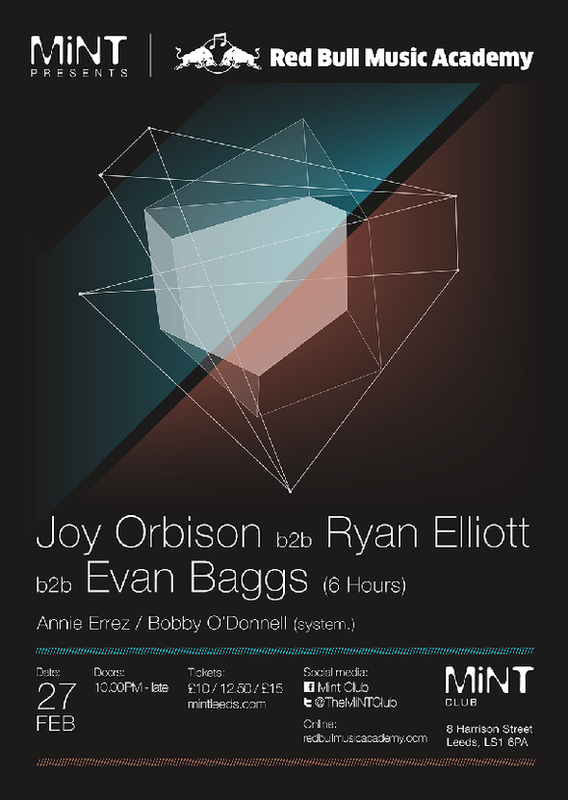 Mint Club resident DJs and Strobewax label heads Annie Errez and Bobby O’Donnell warm up the floor.